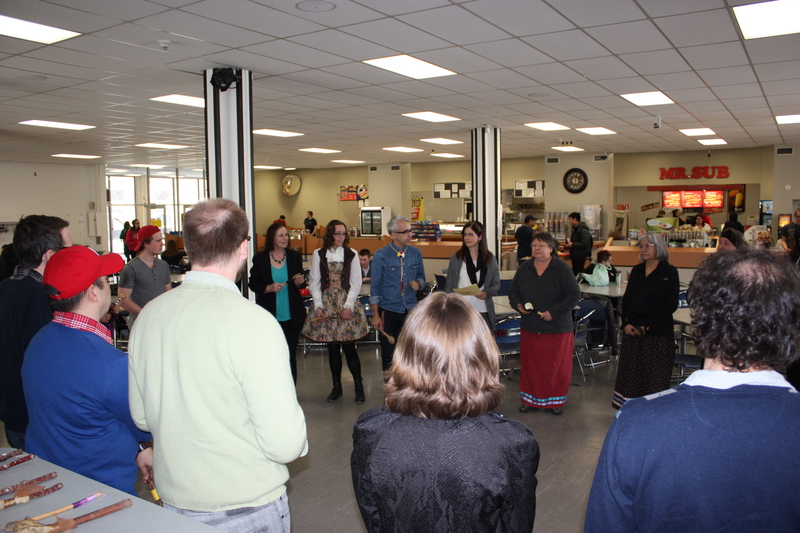 BRANDON, MB – The Brandon University (BU) community had an opportunity recently to view the work of student artists that was displayed in an art show inspired by BU’s Positive Space campaign. 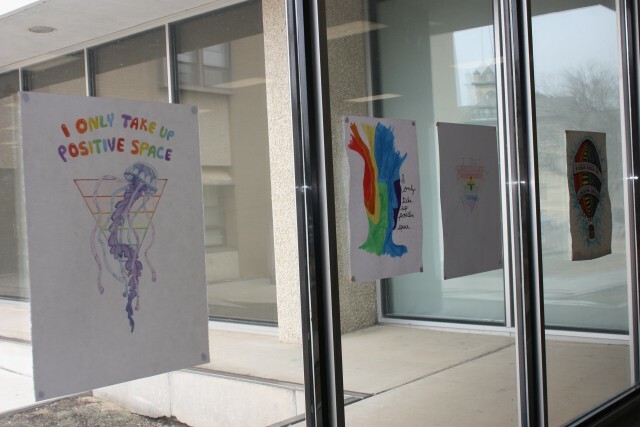 Students of Professor Peter Morin’s Drawing Class II created illustrations to capture their take on the phrase “I only take up Positive Space,” and displayed their work in the University’s Main Dining Hall. As a group, the class decided on an image that best represents the Positive Space campaign to be printed on T-shirts and sold on campus. A second drawing was chosen with the aim of producing temporary tattoos to be distributed to incoming students at Orientation in Fall 2015. Lives of missing and murdered Indigenous women are honoured through singing and rattling. At the event, students of Professor Peter Morin’s Indigenous Studio class honoured the lives of missing and murdered Indigenous women through rattling and singing, inviting all members of the BU community to make space for marginalized voices. Finishing on a positive note, participants were asked to hug each other. BU’s Positive Space campaign was launched in October, 2014 to create an affirming, safer and more welcoming campus culture for lesbian, gay, bisexual, trans*, two-spirit, and queer (LGBTTQ*) students, staff, faculty and community members. Under the leadership of Dr. Corinne Mason, Assistant Professor in BU’s Gender and Women’s Studies and Sociology Departments, this campaign has built awareness by offering workshops and developing a visual identity unique to the goal of Positive Space.